Some houses have a certain je ne sais quoi about them that give them that star appeal. Today, we’ll look at a one in Australia that belongs on a film set. 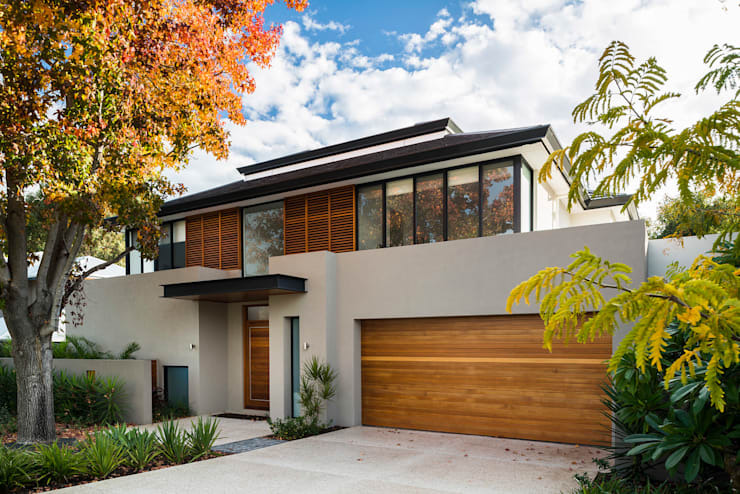 Thanks to interior designers Moda Interiors, this house in the suburbs really shines! We’ll take you through the open planned main floor and show you some of the unique features of the house which give it that Hollywood appeal. Full of a mix of neutrals, the muted colour palette of the house lets the glazing take centre stage. Supporting cast comes from the plants outside that give the house the feeling of being in the tropics. Let’s go tour the house that's made for the movies! The walled facade of the house gives it an upscale feel. Rich wood slathers front door, graces the upstairs shutters, and covers the garage door. From this angle, the building is reminiscent of an Asian temple. The trees and greenery outside are lovely and they give the bold exterior of the house a warm and homey feel. Let’s go take a look inside. 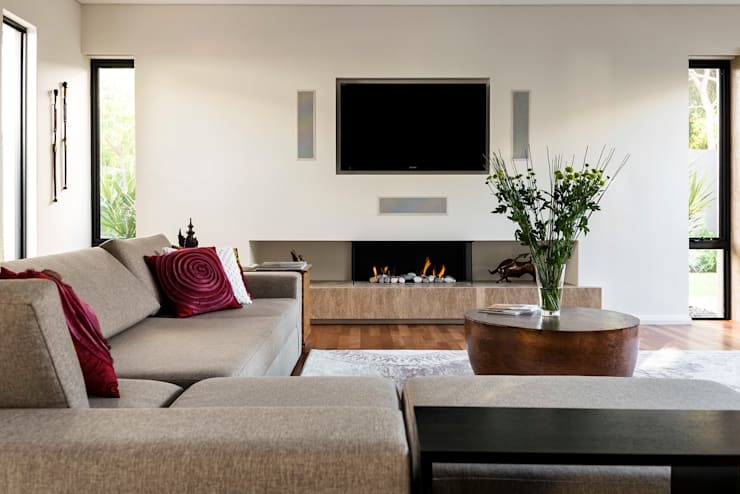 This living room has plenty of seating and features a fantastic fireplace. The bare main wall makes the space feel bright and clean. There is an eclectic mix of neutrals in this living room. The stand-out colours come from the copper brown coffee table and the striated stone fireplace mantle. The tall and narrow windows frame the back wall nicely while the flash of plants outside brings some life into the room. From the dining room we can start to get a sense of the luxury the house! Check out the half windows next to the dining area. They bring light into the space, though you can only look out from them only while seated. All the lights in this room are installed overhead. The round mirror and table shake up the otherwise boxy furniture. The addition of an oversized leather chair brings more texture into the room. We love the abstract light gray carpets in both the living and dining areas. A view from the kitchen shows the impressive open plan main floor. Windows by the kitchen open up to an incredible covered deck space . 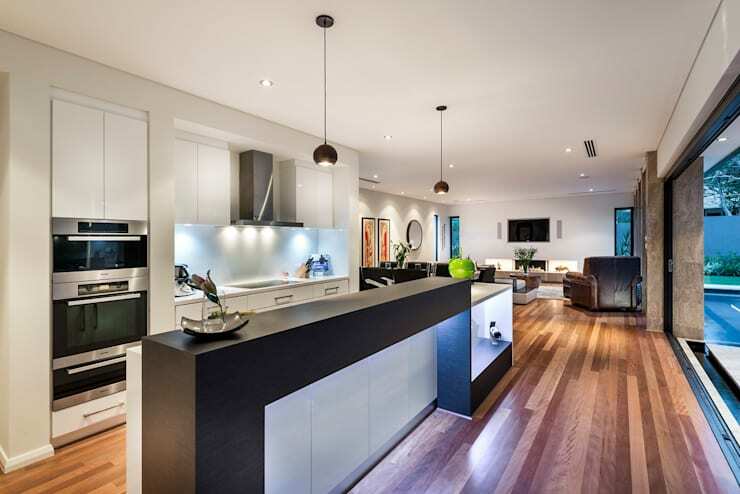 The special lighting in the kitchen island makes this kitchen look space-age! The white and black kitchen looks crisp. The island also features a bar area that would make a great buffet table for having a party or just eating outside. The floors of the open planned room really shine with their high gloss finish. Because we can see the details of the wood grain it adds character to the modern house. The bedroom has lots of space. The plants outside of the windows make it feel like you’re sleeping in the jungle! There is a cozy armchair in the corner making a great place to read. The bench at the foot of the bed gives some storage and is a good place to put some of those extra throw pillows. There is minimal clutter in the bedroom. 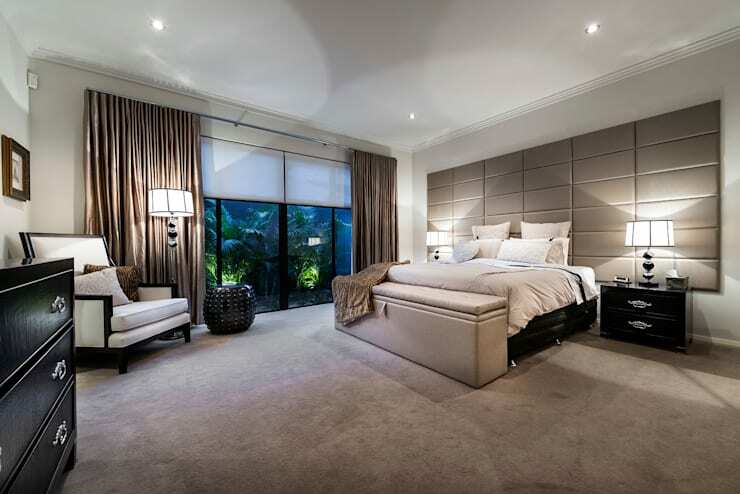 The muted colour palette of brown neutrals makes for a comforting bedroom. The lavish headboard seems to take up the entire wall! The bathroom features the same half windows we saw in the dining area. How daring! Don’t worry, the windows here open to an enclosed space so there’s enough privacy. There is a double vanity kitchen counter here with enough space for everyone to get ready in the morning. 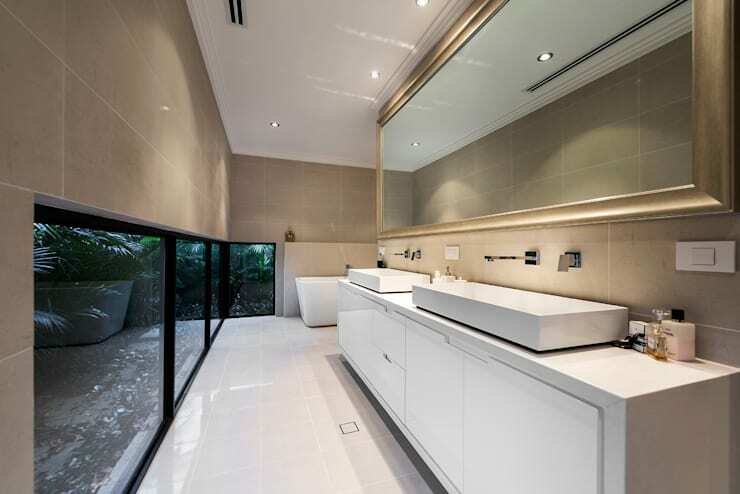 A great alternative for the bathroom is to use jumbo tiles on the walls. Sometimes tiling can make a space look cluttered. There is a luxe gold frame around the mirror that makes this bathroom feel extra classy. This view from the yard shows us a palatial house. The columns of the house and the covered deck remind us again of temple architecture. The backyard offers many spaces for entertaining and relaxing. 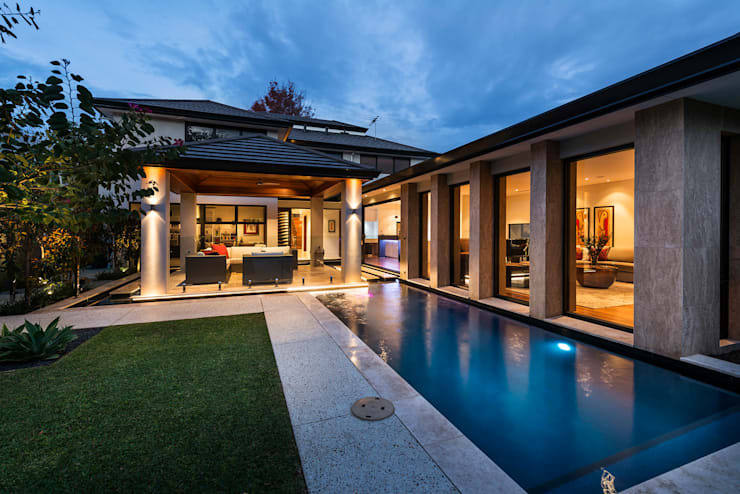 The azure pool and the special glazing of the house give it an elegance that belongs on screen. Thanks for taking a look at this incredible home that looks like it belongs in the movies! 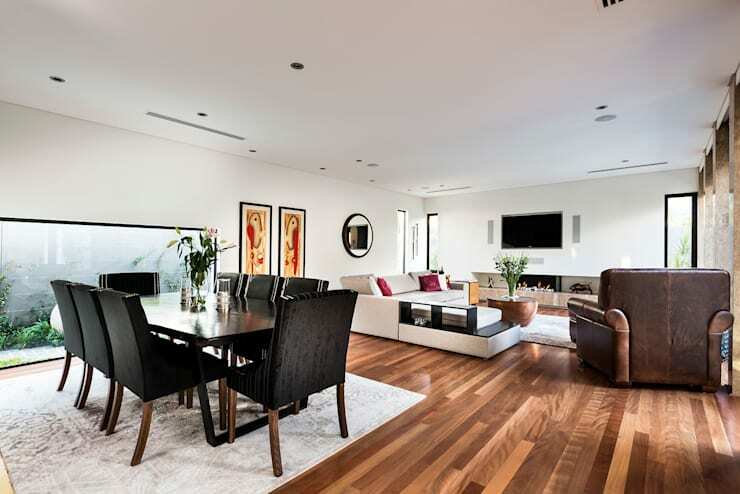 If you want more design inspiration, check out our feature on a home renovated to turn heads. What do you think of this Movie Star home? Let us know below!